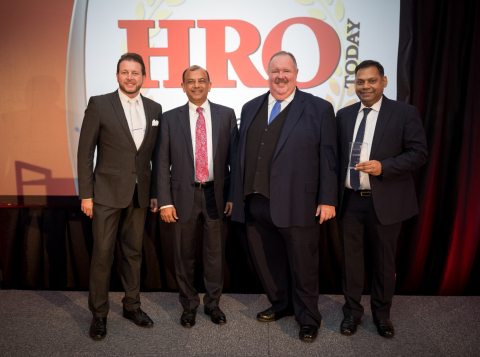 SAN JOSE, Calif.--(BUSINESS WIRE)--Global Upside (www.globalupside.com) has won "Partnership in HR Excellence" award at the prestigious 2018 HRO Today Awards Gala in Amsterdam. The award acknowledges Global Upside's work as an HR partner to some of the world's leading companies. Global Upside provide Hire to Retire solutions spanning talent acquisition, employment documentation, employment law advisory, compensation and benefits, payroll, global mobility, and more. "The Global Upside team has demonstrated measurable excellence in providing HR services in 100+ countries and solving complex challenges that come with operating globally," said Zachary Misko, President of HRO Today Member Services. Recently, Global Upside launched a first of its kind HR software – Mihi (www.mihi.com) – a global HCM, time and benefits management software, for employees in 100+ countries. Mihi is compliant with local statutory wage, hour, and benefits regulations and connects with all major ERP and Payroll systems allowing companies to seamlessly manage global employees and automate the flow of payroll data between systems. “Mihi was created in response to a need from a Client who needed a single software for their 5000 employees spread across 40 countries. They needed it fast and we were tasked with finding a software for them. We realized no single software catered to employees globally so we actually built this software and today it's supporting thousands of employees globally in 17+ languages," said Ragu Bhargava, Global Upside's Chief Executive Officer. "It's an honor to be recognized by HRO Today. We are humbled by the adulation we are getting from our peers in the industry and motivated to continue to do more innovative work and make doing business easier for companies no matter where they operate," he added. Global Upside solves business complexity with world-class HR, Payroll, Accounting, Tax, Compliance, PEO, and Talent Acquisition services. With our integrated, end-to-end support, companies can focus on innovation, growth, and excel in their fields. Founded in 1999 in Silicon Valley, Global Upside today empowers companies in 100+ countries and is dedicated to solving complexity for companies everywhere they do business. Learn more at www.globalupside.com. Global Upside announces winning Partnership in HR Excellence at the HRO Today awards in EMEA and becoming a finalist in North America.